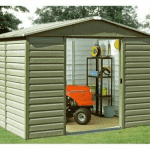 Prefab Sheds - Who Has The Best Prefab Sheds for Sale? 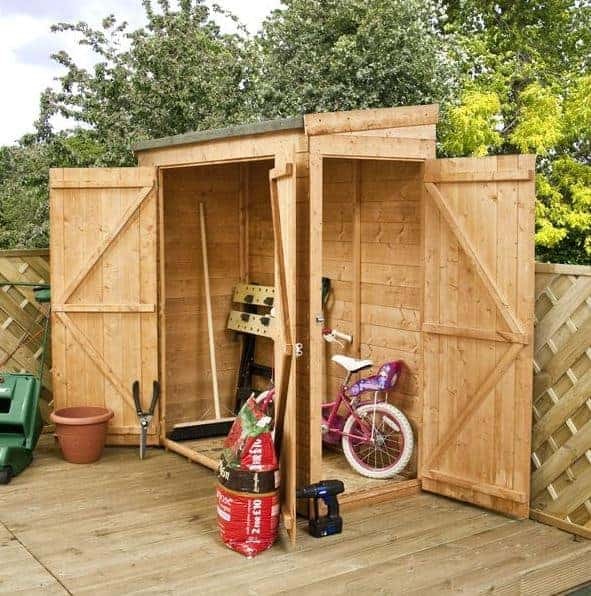 Prefab sheds can be an ideal garden storage solution for those who have busy working or family lives, and for those who aren’t as active or mobile as they once were. Modular designs are becoming increasingly popular on garden buildings, and they make sheds easy and quick to install even for those who have never assembled one before, and without the need for specialist tools. With a growing number of modular sheds now on the market, WhatShed have created this handy guide to the 15 best prefab sheds that are available to buy online in the UK today. Prefab sheds come in many degrees of readiness, but we have considered any that are pre-built in some way and that have a modular and easy-to-assemble design. 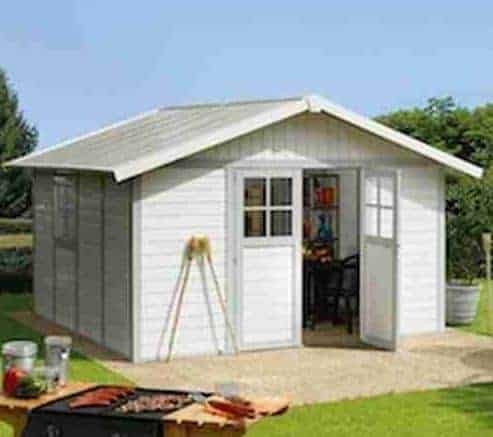 We’ve then considered the price and value for money of each shed, along with its design, durability, and aesthetic appeal. Prefab sheds are becoming increasingly popular thanks to their time saving ease of installation, but it’s still a growing area of the market so we were pleased to find fifteen sheds of such high quality for our league table. Ultimate congratulations go to the eight foot by six foot Rowlinson Deluxe Shiplap shed which thanks to its extended warranty, attractive design and great value for money takes top position among the best prefab sheds that can be bought online in the UK today. Whether you’re looking for modular sheds or metal workshops, or anything in between, WhatShed bring you the independent reviews that can help you make a wise buying decision. 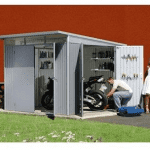 When collating this list of the very best prefab sheds we’ve concentrated on sheds that have a base area of twelve foot by ten foot or less, thus ruling out the larger garages or workshops. 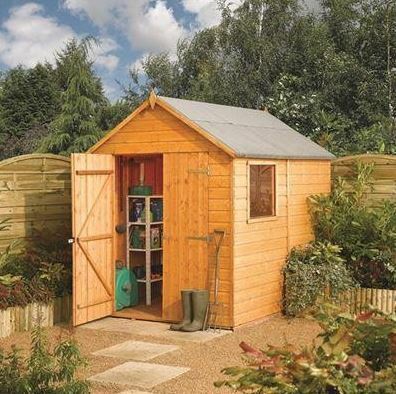 The number one spot is taken by a mid sized shed from Rowlinson, but it gains the coveted prime position by being very well made, durable, and offering excellent value for money. 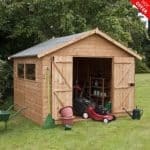 We would have been impressed by a price tag of under four hundred pounds for any eight foot by six foot tongue and groove shed, but this is even better value thanks to the modular design that makes it much easier for two people to piece together. We were very pleased to find that the shiplap cladding locked tightly together, leaving no gaps for rainwater to get through. This is also helped by the apex roof which slides precipitation away. The smooth planed cladding not only performs well, it looks good too; we can imagine this fitting in very well with a traditional garden environment. There’s one fixed window, so the interior is well illuminated on a sunny day, and thanks to the modular design it can easily be positioned on either the right or left which is one of the advantages we often find with prefab sheds. With a 10 year warranty included as well, this is a great choice for those looking for value as well as quality. 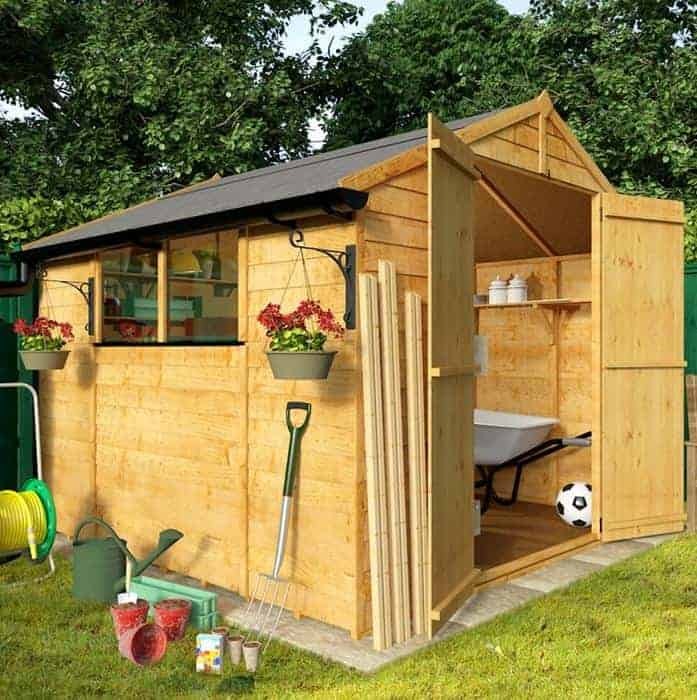 Well built and durable prefab sheds can make an ideal place to store your garden tools and equipment, so that not only is installing your garden building easier, gardening as a whole is easier. Many people, however, worry about the security of items kept inside a shed. That’s understandable, and it’s one of the reasons that we like this modular apex shed from Windsor so much. It has a completely windowless design, and this means that it’s impossible for passers by, who could be potential thieves, from seeing if anything valuable is being kept inside; this makes it much less likely to be broken into. At five foot by seven foot it’s not one of the largest prefab sheds we’ve reviewed, but the wide opening double doors at the front make it easy to move items in and out, so that the owner can make full use of the space available. We were pleased to see shiplap cladding used, especially at such a low asking price, as this gives it both strength and stability. A ten year warranty against rot is provided as well, which is something we’re always pleased to see. 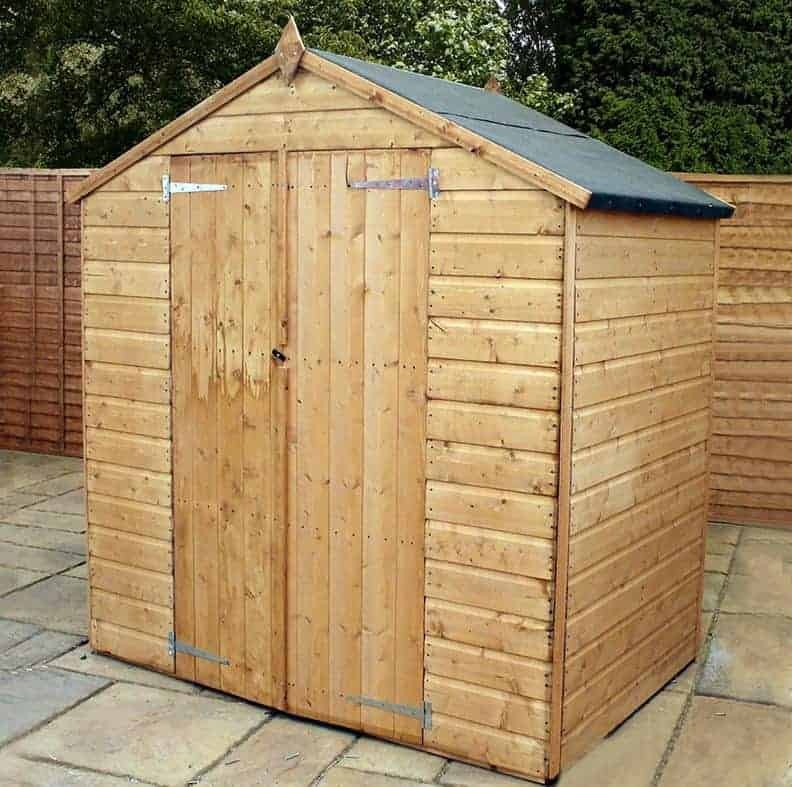 It’s the price tag of less than three hundred and fifty pounds for a well proportioned and secure shed, however, that earns it the second place in our league table. Whilst we always welcome the toughness that comes with shiplap and tongue and groove cladding, that doesn’t mean that budget overlap sheds can’t bring benefits of their very own. A great example of this is the BillyOh 30 economy shed, which has earned a place in the top three of our run down of the very best prefab sheds. The first thing that caught our eye was its very attractive design, as the overlapping cladding gives it a rustic appeal that we know many people appreciate. 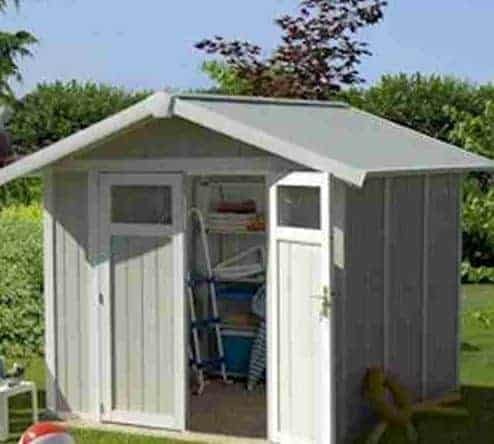 Even more appreciated is the low price tag, meaning that people can enjoy the advantages of an easy to assemble eight foot by eight foot shed for not much more than three hundred pounds, and it’s this that helps it achieve such a lofty position. This very accommodating base area is helped by an apex roof that rises up to 2.10m high, which is taller than we see on many prefab sheds of a similar price. There are two fixed windows on the side, meaning that there’s no need to install artificial lighting if you want to use the shed to pursue a hobby or craft work of some kind. It should be noted that adding a floor will involve an additional cost, but even allowing for this we still feel that it represents good value for a wooden shed that comes with a 10 year guarantee. The larger prefab sheds are, the more of an advantage their modular design becomes. 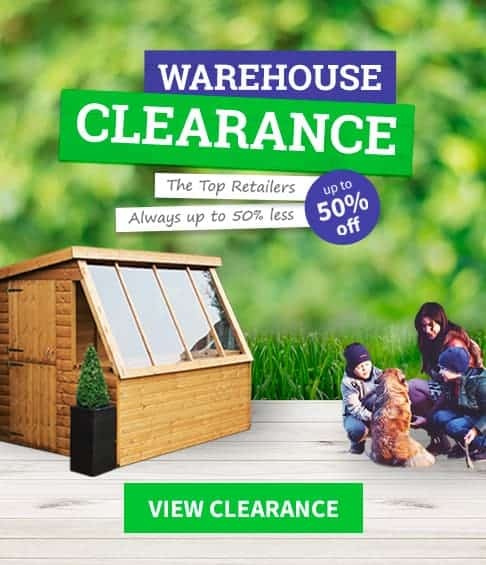 This particular model has a very generous base area of 3.03 x 3.03m, and many people may feel daunted by the prospect of assembling such a large garden building themselves. Because installation only consists of putting together ready made panels, it’s much quicker and easier than you might imagine. This will certainly save time, but it could also save money that may otherwise be spent paying somebody else to do the installation work. One again we have overlap cladding used for the wall, with OSB being utilised for the felt covered apex roof and the floor. Despite its size, however, this still feels reliable and stable once it has been pieced together. One of the things that we liked most about this model is that it has four windows, giving it one of the brightest interiors of any of the prefab sheds we’ve reviewed. Because of this, we can easily imagine this being used as a low cost workshop for either business or leisure purposes, giving it added flexibility and added value, especially as it too comes with the reassurance of a 10 year manufacturer’s warranty against rot. 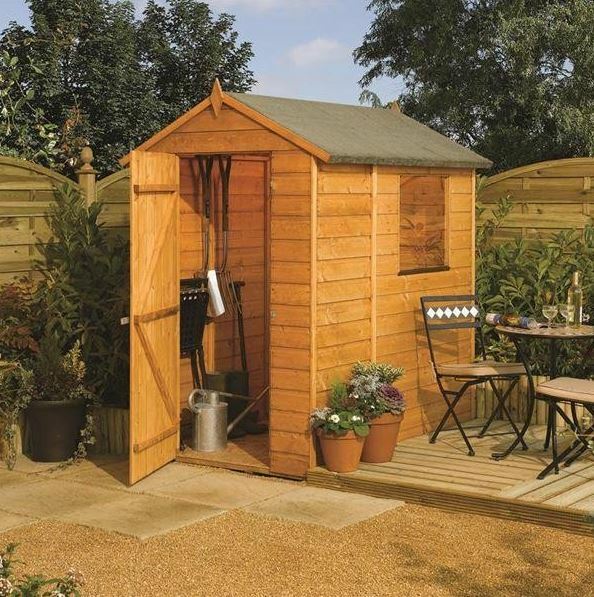 Not all gardens are large and spacious, and this Rowlinson shed can be an ideal purchase for those with smaller lawns where room is limited. What we were pleased to see, however, was that despite its compact footprint the manufacturer had still created a high quality and durable garden building. The 12mm shiplap cladding places this among the strongest prefab sheds that we’ve seen, but because of its modular nature it’s still easy to manoeuvre and put together during the installation process. We were also pleased to see that the timbers had been dip treated and therefore comes with the peace of mind bringing 10 year warranty period. It’s worth noting here that we don’t see pressure treatments, or tanalisation, being used on prefab sheds as we sometimes do with self-assemble sheds, but hopefully this may change as the market develops and expands in future years. This has a neat and classic design that we really liked, with an apex roof with diamond shaped finials, and a square window on one of the interchangeable side panels. With the addition of a paint or stain, which is something that we always recommend for unpainted wood that’s going to be placed outdoors, this could become a very attractive feature for the garden. Whilst most of the prefab sheds that feature in this top fifteen league table are made of wood, we now come to a model that features PVC cladding. This brings with it many advantages, primarily that it can’t rot or rust, and doesn’t need any kind of treatment adding on an annual basis, so that once it has been assembled it’s virtually maintenance free. It comes with a ten year warranty, but because the plastic substrate is so tough and durable we would actually expect it to last for much longer without any problems occurring. Plastic prefab sheds such as this one are even easier to construct than their wooden counterparts, as they are very lightweight. What we liked most about this shed, however, is its appearance. Some plastic sheds can look a little anodyne or plain, but this boasts an exciting design that really caught our eye with an overhanging roof, and pastel blue colour scheme. We accept that it might be a little too contemporary for the taste of some people, however, and it also comes with a price tag that will put it beyond the budget of some, even allowing for its generous dimensions. This accounts for its position outside of our top five, but if you like its original design and don’t mind the asking price, this could be an ideal purchase. These small yet very well formed tongue and groove prefab sheds once again have no windows. This means that a source of artificial lighting will need to be added if you want to spend any time inside, or alternatively a torch could be positioned near the doorway. We do welcome this lack of windows as a security enhancing feature, however, and with the addition of a padlock, which can be a very inexpensive additional purchase, this could be an ideal secure storage area for the garden. We also liked the asking price of less than three hundred pounds, although this is slightly more expensive than the windowed six foot by four foot shed made by Rowlinson, which accounts for their relative positions within our league table. Solid sheet flooring is used, but we often find this in the prefab sheds we review as it helps to keep the overall weight of the packaging down as well as the cost to the consumer. We were pleased to see, however, that on this occasion the floor also came with integral floor bearers that had been pressure treated. This elevates the floor itself above ground level, and is a major advantage in the fight against rot causing ground moisture. The 10 year warranty is in part testimony to how effective they are. 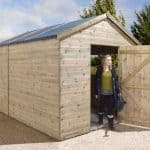 This compact yet clever garden building has a design unlike any of the other timber prefab sheds we’ve reviewed, but this not only gives it a look all of its own it also makes it a useful addition to any garden. 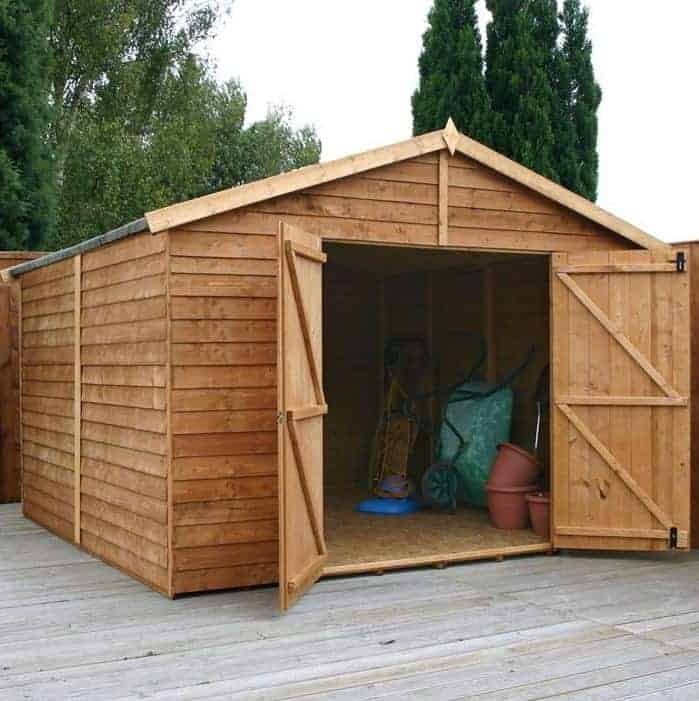 It’s the smallest shed in our league table, with a base area of 1.79 x 0.79m, but we can imagine it being used as a storage space for a small garden or allotment, or as an additional shed alongside a workshop or larger garden building. It’s also the most inexpensive of all the prefab sheds in our list, which helps it gain its position. What makes this design unique is that not only do the double doors at the front open up, but also a single hinged door on the side panel. This makes it very easy to move even wide or bulky objects in and out, belying its compact size. As it has a pent roof, it can also be hidden away behind a fence or wall, making it a more secure storage solution, especially as there are no windows to let prying eyes see what’s inside. We were glad to see tongue and groove cladding used as well, and that it came with a 10 year guarantee, which isn’t something we’d necessarily expect with prefab sheds of this size and this price. It is rare to see prefab sheds made out of metal, even though in many ways it’s an ideal substrate for modular construction being lightweight and rigid. 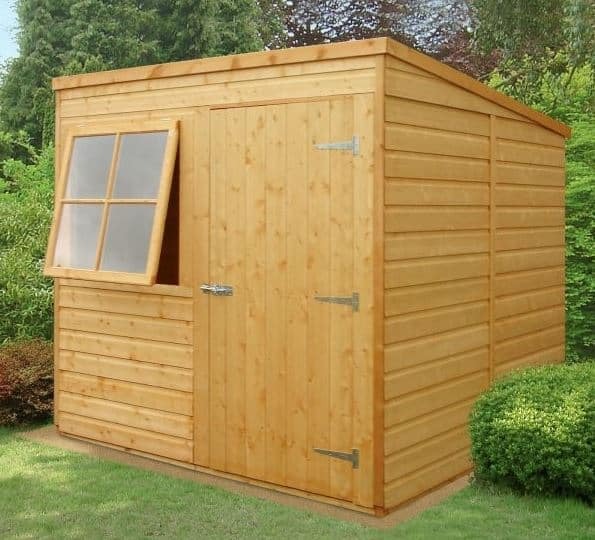 The centurion shed from Asgard, however, would make a great addition to any small or medium garden, and it’s only a higher than average price for a seven foot by five foot apex roofed shed that prevents it from being placed towards the top of our WhatShed league table. What instantly caught our eye was the dark green colour scheme of the shed, which should go some way to allaying the concerns of people who don’t want anything that looks too obviously metallic in their garden. It gets its attractive colouring from a polyester coat that’s been applied over the top of a galvanises steel core. It’s an extra layer of protection that makes it immune from rust as well as rot. For this reason we would expect it to be very long lasting, although once again the warranty period supplied by he manufacturer only lasts for 10 years. What we liked most of all about these prefab sheds, however, is that extra modules of 1.10m metres depth each can easily be added on to the main body of the shed, so that you can have a shed that’s as long as you want and still easy to assemble. 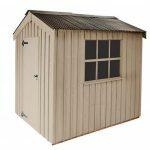 This is the largest of all the wooden sheds that feature in our league table of the very best prefab sheds which can be bought online in the UK today. Its width and depth of 2.97m each means that it can store a large amount of tools and equipment inside, but it could also be used for so much more. The tall apex roof has a ridge height of 2.25m, so there’s lots of room to move around in. That means this could easily be used as an inexpensive and easy to install workshop. If it’s to be used as a workshop then artificial lighting will need to be installed, but the lack of windows can be a real boost to the security of a workshop where expensive machinery and computing equipment can be stored. The unbroken window free cladding, when allied to its large size, gives this a tough appearance as well, and this too could be enough to deter some opportune thieves from attempting to break in. 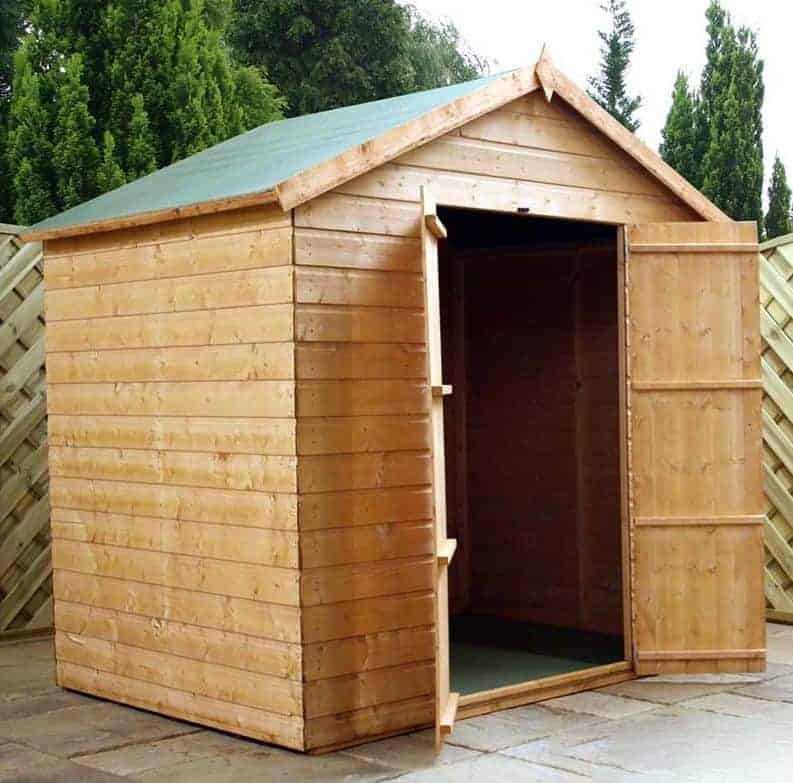 At this size we would have preferred to see tongue and groove rather than overlap cladding used, which is one reason that it doesn’t feature in the top half of our list, but this still provides very good value for those in search of larger wooden prefab sheds with a 10 year warranty. 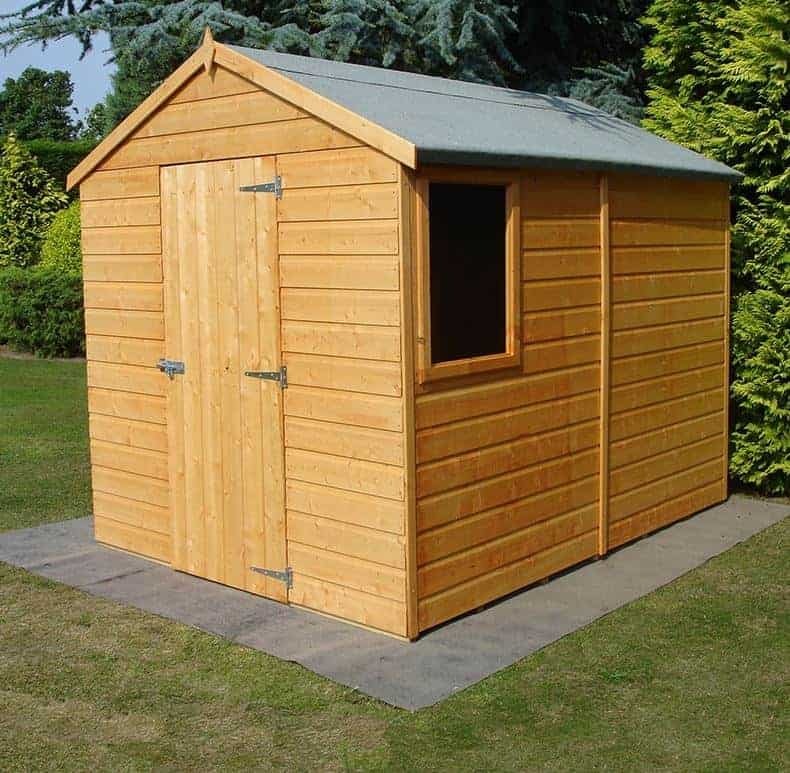 With a base width of 2.05m and a base depth of 2.97m this is one of the larger wooden prefab sheds in our league table, which makes the price tag of not much more than four hundred pounds seem even better value for money. At this price, relative to its generous dimensions, we would have expected it to feature cheaper overlap cladding, so we were pleasantly surprised to find that it had tongue and groove cladding for both the walls and the flooring. Coupled with its modular design it’s both easy to assemble and reliably stable once installed, making it a very useful addition to gardens that are in exposed areas that are often subject to strong winds. There’s a double door at the front, which we were pleased to see had a padbolt that was holed and ready to accept a padlock. As there is also a square window on a side panel, this is a useful addition for security purposes. We also liked the slight overhang of the roof, which is something that we rarely see on wooden prefab sheds. It creates a natural canopy effect that provides a useful shaded area in front of the entrance on sunny days. It’s only the lack of an extended warranty that prevents this shed from being placed higher. This is the second of the Shire prefab sheds in succession to make it into our top 15 league table, and once again it’s only the provision of a one year statutory warranty, rather than the extended warranty that we always like to see, which keeps it towards the foot of our list. This also means that there is an onus on the owner to apply annual preservative treatments to ensure that wet rot is kept at bay, but on a small to mid sized shed such as this one that needn’t be too time consuming or costly an undertaking. 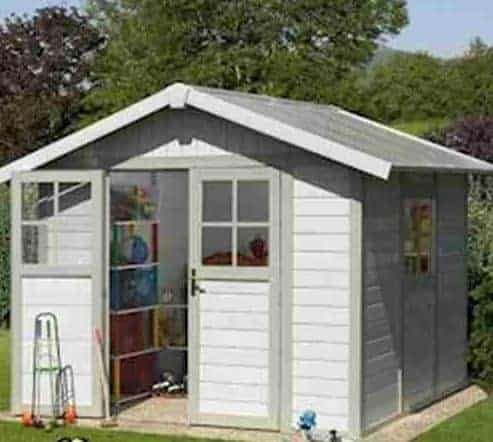 It’s price that earns this shed a place among the very best prefab sheds we’ve seen, with the asking price of approximately three hundred pounds representing very good value for money for an eight foot by six foot shed even without an extended warranty. We were especially impressed by the use of tongue and groove cladding for such an affordable shed, and this also gives it classic good looks that make it appear much more expensive than it actually is. It also helps ensure that there is little chance of water penetration, especially as the apex roof at the summit slides water away rather than giving it a chance to settle on the surface. We’re big fans of the Grossfillex range of prefab sheds, although they do come with large price tags that can place them outside the budget of some potential customers. 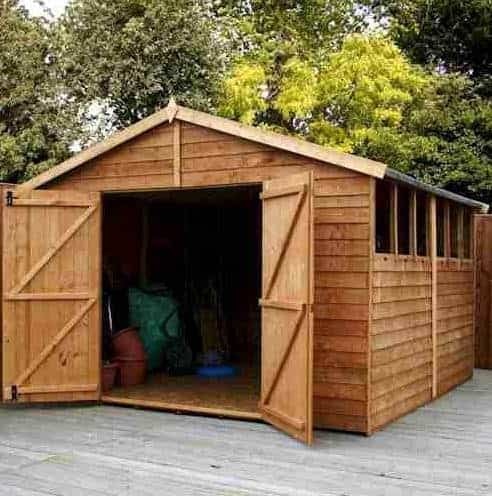 This has been taken into consideration when determining their placings within our league table, but if money isn’t as much of an issue as obtaining a high quality and durable garden shed then this and its stablemates deserve to be given serious consideration as it will make an attractive and original addition to a garden that should retain its good looks for many years to come. This is the mid sized model within the Deco range of plastic prefab sheds, yet with a base area of 2.39 x 3.15m there’s lots of room to move around in. Despite being very strong and durable, as we’d expect from a PVC shed with a 10 year guarantee, it’s very lightweight and with a modular design it’s easy to assemble. Ease of access is also very easy, thanks to the inclusion of a double door at the front and a single door at the side. As all doors are semi-glazed there’s lots of light inside as well, and we were especially pleased to find that the doors feature key operated locks as standard. This greatly increases the security of the building, and with added peace of mind comes added value. The vast majority of wooden garden buildings in this league table of the fifteen best prefab sheds have apex roofs. Whilst these can be very convenient in terms of the extra vertical space they typically provide, many people prefer the less ostentatious pent sheds. This is an excellent example of a pent shed, and the pitch of the roof is pronounced enough to ensure that rainwater is carried harmlessly away. The ridge height of 2.02m and eaves height of 1.77m are also taller than we often see in similarly sized pent sheds, so it doesn’t feel too claustrophobic inside. 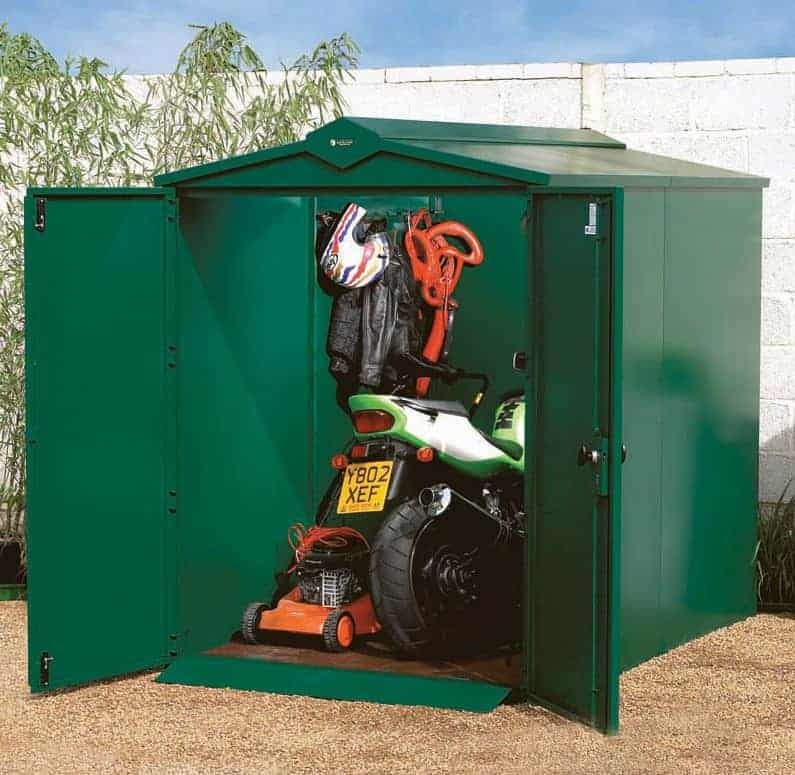 The seven foot by seven foot base area is an ideal size for most small gardens, as it provides more than enough storage space for a lawnmower and a good selection of garden tools, and yet it won’t take up too much room from the garden itself. We were pleased to find that tongue and groove timber is used for the flooring as well as the walls, which isn’t always something we find on small and mid sized prefab sheds. We also liked the thickly glazed opening window, making the shed easy to ventilate on a warm day. 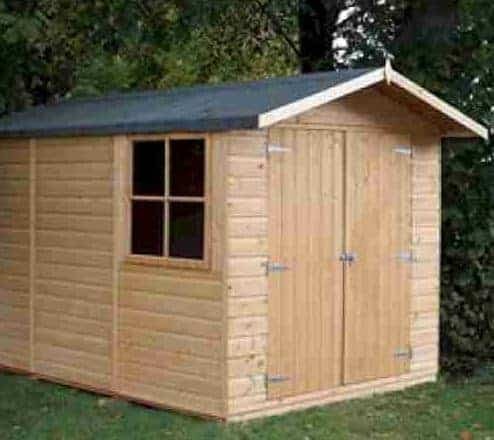 This is a compact pent shed with a lot to recommend it, and an extended warranty period would have seen it achieve a much higher position. 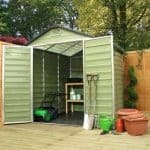 The final place in our WhatShed guide to the very best prefab sheds is taken by another plastic shed manufactured by Grossfillex. It’s fifteenth place, however, is only an indicator of a near two thousand pound price tag rather than a reflection of its overall quality. This is one of the toughest and most durable prefab sheds that we’ve seen, and thanks to its very large 3.55 x 3.15m base area its very flexible too. This would make an ideal shed for a larger garden, where its contemporary design and pastel sheds can make it a real talking point, but its size and profusion of glass means that it could also be used as a stylish workshop or even as a summer house. It’s not only the largest of the prefab sheds in our league table, it’s also among the tallest with the overhanging apex roof giving a very accommodating eaves height of 1.88m, the equivalent of six foot two. We also liked the inclusion of key operated locks on both the double doors and the single door at the side. If this falls within your budget, and you want a good looking modular shed that’s large, durable and secure, then you may want to elevate this to the top of your list rather than the foot.